Colt Solarfin is a fixed or moveable external solar shading system made from aluminium extrusions designed to reduce heat gains and glare in summer and reduce heat loss in winter. Solarfin may be installed either vertically or horizontally in front of the façade or on the roof. It can be either fixed or moveable. 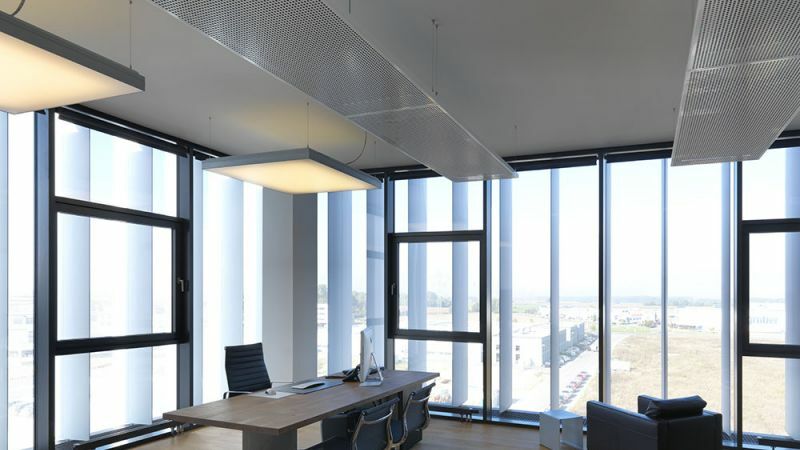 High performance - Excellent heat reflection along with controllable transmission of light to the building. 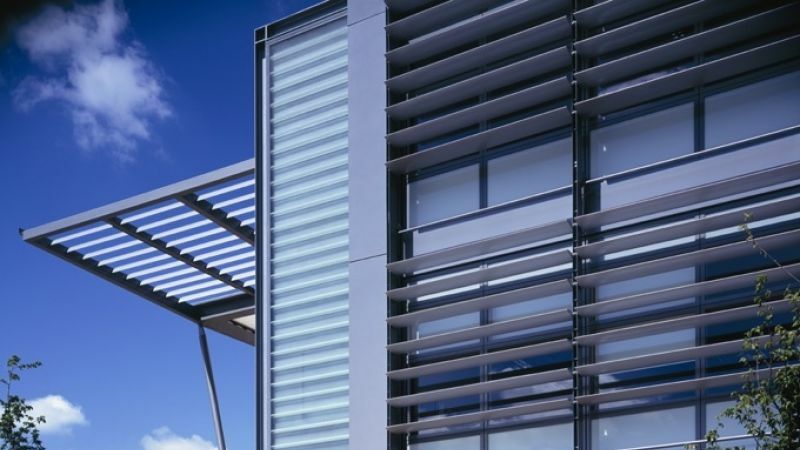 A wide range of louvres – Solarfin louvres are available in various configurations and colours to meet specific design requirements. Click the options tab above to find out more. 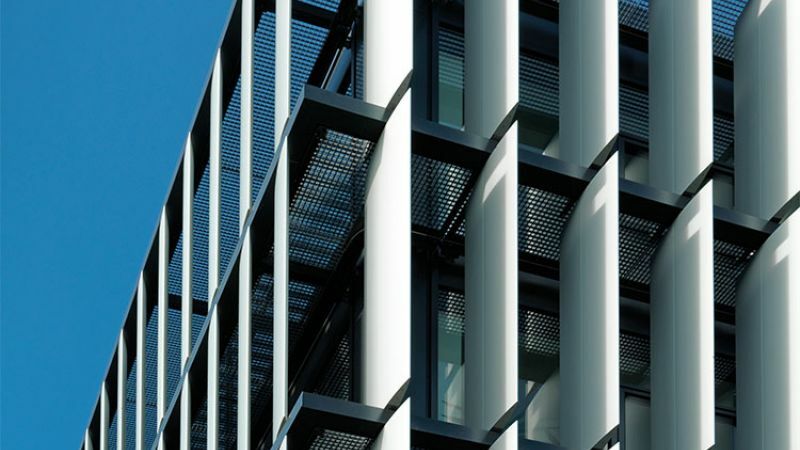 Flexible controls - Solarfin shading systems can be operated by linear actuators that have the capability to operate complete facades. Either the series of louvres are attached to a system of levers and push rods which link them to a control system, or they are moved using gearboxes. The louvres can rotate round 90⁰ under motorised control with the lever system and round 360⁰ with the gearbox system. Robust - All components including the supporting construction are manufactured from extruded aluminium alloy with stainless steel fixings. The system is designed to compensate for thermal expansion. The hollow sections of the louvres optimise their weight to strength ratios. Potential to reduce installation time – Solarfin can be provided in modular pre-assembled form. Generic types - click the options tab above to find out more. 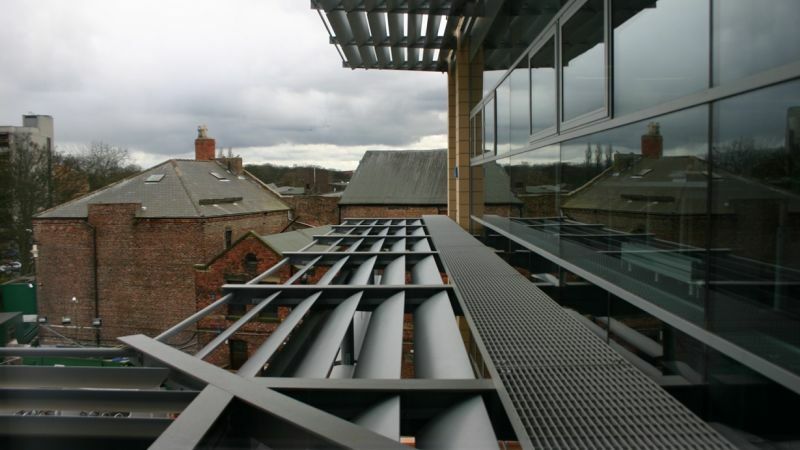 Solarfin comprises a series of extruded aluminium louvres mounted into a support frame. The louvres may be fixed at any angle and can rotate under motorised control within a range of up to 360⁰ depending on the control system selected. 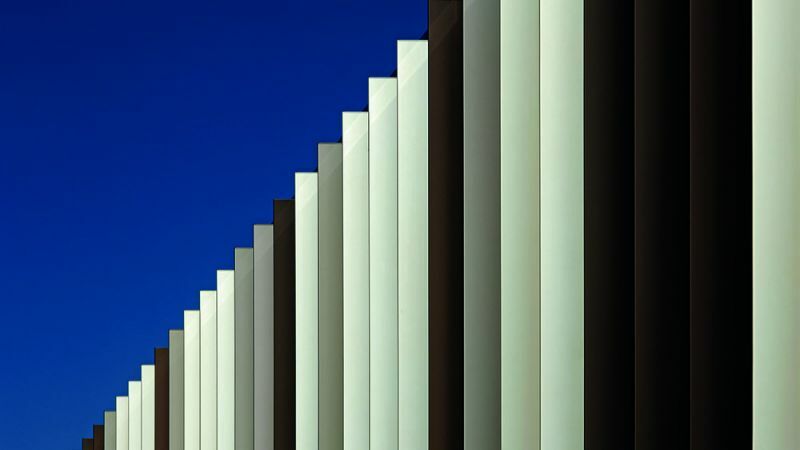 With 8 standard profiles, louvres are available as one-piece extrusions in widths up to 400mm and as multiple clipped together extrusions in widths up to 1050mm. Spans can be up to 6m without intermediate support and up to 10m with intermediate bracing rods. Fabricated and perforated fins are also available. Colt has a wide range of standard profiles but bespoke profiles and designs can be developed on larger projects. Solarfin is available either mill aluminium, polyester powder coated to a RAL colour or anodised. 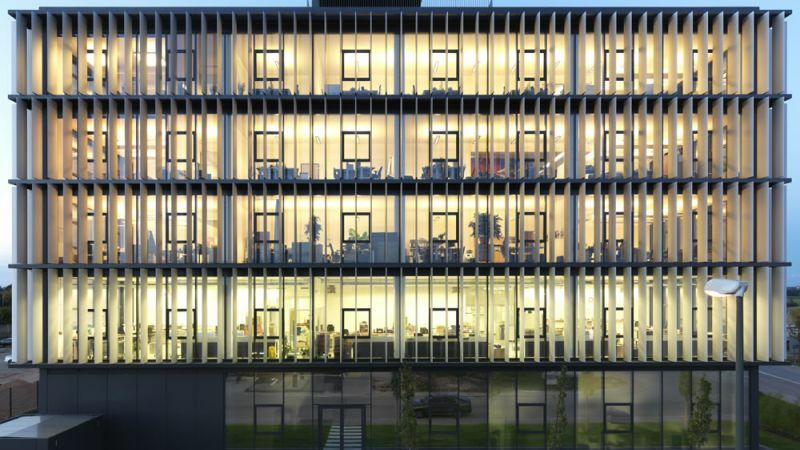 A fixed solar shading system may only truly be effective on a south facing building. 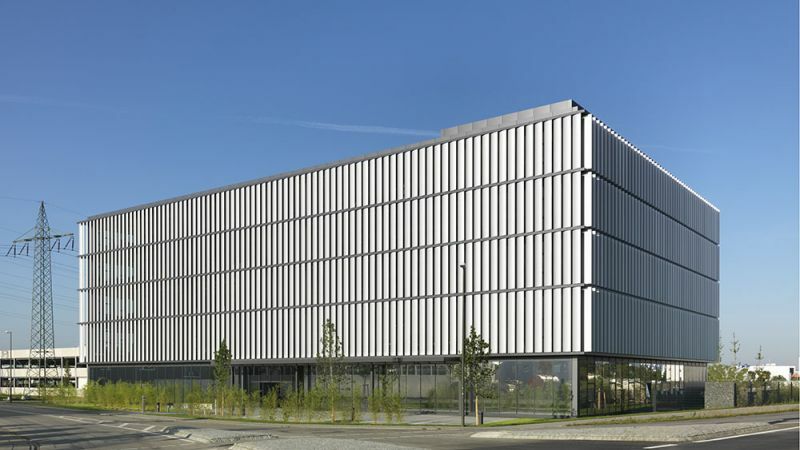 Controllable solar shading systems can better optimise the flows of heat and light energy than fixed solar shading systems. Since the louvres are designed to follow the path of the sun, daylight levels may be optimised whilst radiation levels are reduced to a minimum. The likelihood of over-shading or under-shading that frequently occurs with fixed solar shading is reduced, since the louvres are always set to optimum shading angle. An additional benefit of movable systems is that when they are closed, they can provide additional security and can help reduce winter heat loss. Colt ICS 4-Link or Soltronic are the standard controls for Solarfin. These provide accurate control of the louvre blades, continually calculating the position of the sun and together with internal temperature and lighting sensors controlling the position of the louvres. On dull days, light sensors can operate to fully open the louvres to allow the occupants full vision to the outside at all times. Remote operation is also available via an internal modem interface. We can assess a client’s design and provide a bespoke solution to meet all aspects of a project. 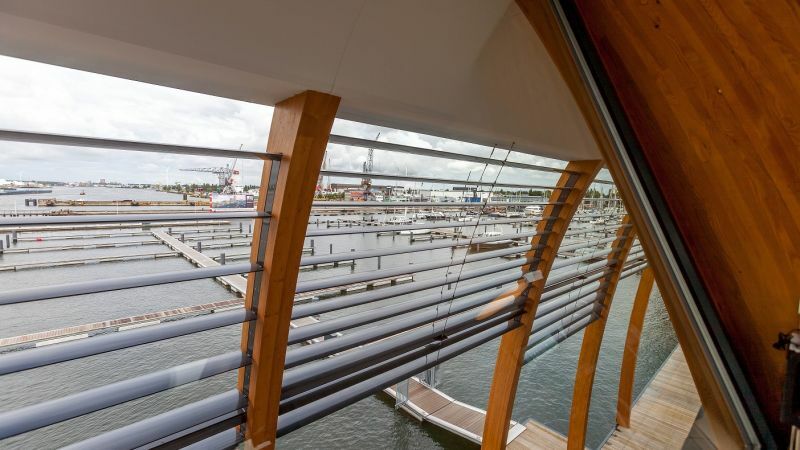 Backed by an experienced technical support team, we can work with the customer from the earliest stages of the project to design an aesthetically pleasing, high performance solar shading system. We also offer complete project management, installation, wiring and commissioning, which means that we take complete responsibility to ensure that the product is in full working order within one package of works. Please contact us for more information relating to the application, specification, installation or servicing of Solarfin. 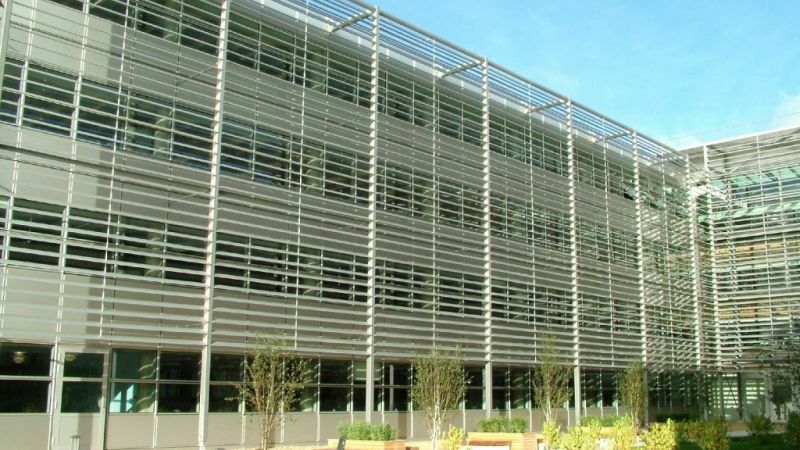 Colt Solarfin is an external fixed or moveable external solar shading system made from aluminium extrusions designed to reduce heat gains and glare. The above list shows the standard extrusions. Special size extrusions are available on request, in a wide range of shapes and sizes, from 60 to 750 mm wide. Large bespoke profiles can be up to 1050 mm wide. Louvre blades, side support arms, mounting brackets and support struts are made from aluminium.